cut their iPhone sales estimates, and Apple shares were are down almost 8 percent in the past two weeks through Friday. The stock got a bit of a reprieve on Monday, with RBC analyst Amit Daryanani saying the “magnitude of investor negativity is likely overdone.” Investors could also still find reason for optimism in the potential for strong growth from Apple services and an upgrade to the company’s capital return program. Morgan Stanley said it expects Apple to hike the program by $150 billion to a cumulative total of $450 billion by 2020 and increase its quarterly dividend to 94.5 cents a share from 63 cents. Apple shares rose as much as 3 percent, the most since March 29, to $167.26 in New York and were trading up 1.7 percent at 1:04 p.m.
reported weak demand for high-end handsets, another sign the smartphone boom that made Apple the most-valuable company is ebbing. It’s also under pressure in China, where some consumers are shunning pricey iPhones and local rivals like Oppo and Vivo are grabbing market share. On Tuesday, Apple is expected to report fiscal second-quarter iPhone unit sales grew just over 2 percent from a year earlier. For the fiscal third quarter, unit sales will be down 5 percent year-over-year, according to average analyst forecasts compiled by Bloomberg. Expectations were higher when Apple launched new phones late last year. However, the iPhone 8 and 8 Plus looked similar to the iPhone 6 and 6 Plus models from about three years earlier. The iPhone X had a bright, edge-to-edge display and 3-D facial recognition, but the $999 starting price was too much for some consumers. “That lower-priced iPhone X, essentially, should be a successful product. That launch itself could move iPhone sales up 5 percent a year,” said Gene Munster, co-founder of Loup Ventures and a longtime Apple analyst. Still, he warned that the days of 15 percent annual iPhone growth are over. When the X launched last year, Apple paid handsomely for the new Face ID system, stainless steel casing and sharper, more efficient OLED screen technology. The iPhone X’s parts cost $115 more than the iPhone 8’s, according to a November analysis. That made it difficult to price the product much below $999, without slicing Apple’s legendary profitability. The new, lower-cost iPhone will use an LCD display that’s about half the cost of the OLED screen in the iPhone X. It’s also likely to use an aluminum casing versus stainless steel. That could bring the price close to $700, a level that’s proven successful for many years. 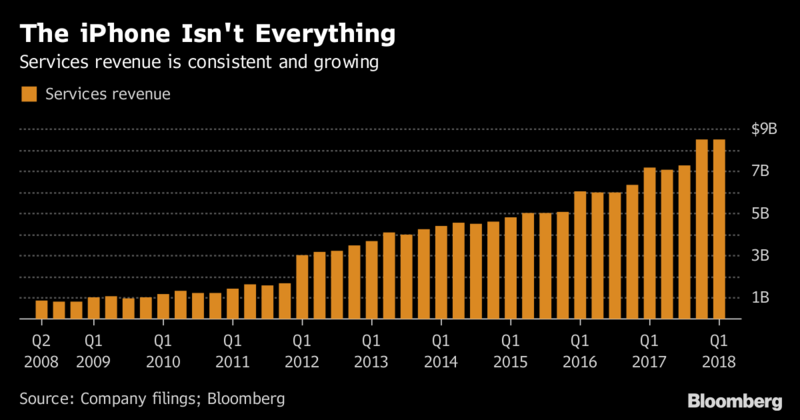 Analysts are looking for revenue of $61 billion in the fiscal second quarter, or 15 percent year-over-year growth, according to data compiled by Bloomberg. Earlier this year, Apple forecast sales between $60 billion and $62 billion for the period. Fiscal second-quarter iPhone unit sales are expected to be 51.9 million, up from 50.8 million a year earlier, according to average analyst forecasts compiled by Bloomberg. For the fiscal third quarter, analysts see 39 million iPhones sold, on average, down from 41 million in the same period of 2017. The average selling price for iPhones will be $740 in the fiscal second quarter and $691 in the third, according to average analyst projections. Fiscal second quarter services revenue will hit around the $8.5 billion level reported in the holiday quarter. Munster sees 18 percent to 20 percent growth. Analysts are also looking for growth in Apple’s Other Products unit, which includes the Apple Watch, AirPods and HomePod.